IBEW Local 26 was busy this December collecting food and charitable donations to benefit S.O.M.E. (So Others Might Eat) in Washington, D.C. Collected donations totaled over $8,000 worth of food. Generous contributions were provided by IBEW Local 26, day and night school students of the JATC and holiday party donations from Local 26 members. 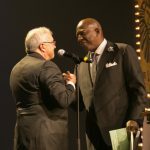 Electrical Alliance contractor C3M Power Systems LLC contributed cash, as well as food donations; and, Perlectric., Inc, another Electrical Alliance contractor, donated Giant Food gift cards. 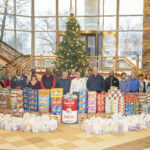 IBEW Local 26 has held an annual holiday food drive since 2008. 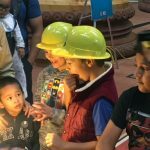 In conjunction with the Joint Apprenticeship Training Committee (JATC) and the International Brotherhood of Electrical Workers (IBEW) Local 26 , The Electrical Alliance participated in Big Build 2018 Saturday, October 13, 2018 at The National Building Museum in Washington, D.C.
On, Saturday, July 28, 2018, the Local Union 26 Minority Coalition (LU26MC) held its 10th Community Service Project (CSP) in partnership with the District of Columbia Housing Authority (DCHA) at the Kenilworth Parkside neighborhood in northeast Washington, DC. 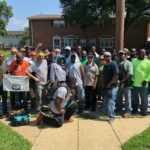 31 participants from apprentices to Journeypersons to retirees who gave of their time on a hot, humid, sunny Saturday morning to come out and restore much needed porch lighting for the residents of Parkside. This is the 10th project in the last five years, a cumulative 1,046 hours of volunteer work. 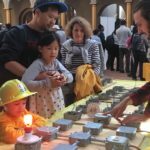 The Electrical Alliance, in conjunction with the Joint Apprenticeship Training Committee (JATC) of the International Brotherhood of Electrical Workers (IBEW) Local 26, will participate in Big Build 2018 on Saturday, October 13 at The National Building Museum in Washington, D.C. from 10 am to 4 pm. Near the end of 19th century a group of skilled electricians chartered the International Brotherhood of Electrical Workers Local 26 in Washington, D.C. Since 1892, thousands of journeyman electricians have been trained by the union and have worked on countless projects around our region—from remodeling the White House in 1902 to rebuilding the Pentagon after the September 11, 2001 attacks. 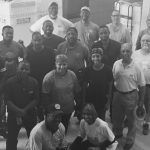 On Saturday, August 19th approximately twenty volunteers–members of Electricians’ Local 26, who are also members of the Local 26 Minority Coalition and employees of the District of Columbia Housing Authority—gathered in the Lincoln Heights Housing Development, for the seventh joint community services project between Local Union 26 IBEW (LU26IBEW) and the District of Columbia Housing Authority (DCHA).